Chinese Scientists Confirm Warming Hiatus For China, 2001-2015 | Watts Up With That? August 25, 2018 in Hiatus in Global Warming. Modern day climate science (aka Climate alarmism) has always promoted the theory of CO2 warming causes a positive feedback of more water vapour which then causes more back radiation which then causes more warming which then causes more water vapour and on and on ad nauseam. This is the so called runaway global warming CAGW armageddon scenario that we are are all familiar with and yet have never experienced. CO2 levels in the past have been almost 8000 ppm and the earth still hasn’t seen armageddon. The reason is that there is no such thing as a positive forcing of temperature in the atmosphere. The IPCC makes a big deal of this with many different so called greenhouse gases but always forgetting about the largest greenhouse gas water vapour. The IPCC provides no exact method by which positive forcing would happen or when, but instead just provides the general scenario that I did in my 1st sentence. Why has the IPCC been unable to provide a detailed process of CO2 heat forcing? It is because it doesnt exist. The IPCC has been unable to counter the argument that only 8% of the upward IR has even the potential to be absorbed by CO2 and water vapour. Since water vapour can be anywhere from 0 to 100 times the amount of CO2 in the air , any small increase of CO2 in most any local area is dwarfed by the water vapour content. Since CO2 only increases 1/2 % per year, and water vapour can increase up to 40000 times in any local area, there would have been runaway positive feedback from water vapour itself in a local area. The tiny amount of potential IR (8% ) that may get absorbed by both CO2 and water vapour is immediately carried away to the atmosphere by the N2 and O2 because of the 10^9 number of collisions per second that is happening. To get an idea of how impossible it is for LWIR to heat the air, try pointing a powerful hand held infrared heater upwards towards the sky in a shelter with no roof. No matter how long you point you will not heat that air in the shelter. If it happens to be freezing cold in that shelter in the winter time; you will freeze to death(without cold weather protection) long before your thermometers register a change in temperature. If water vapour was providing a positive reinforcing, the 86.4 W/m^2 of evapotranspiration at the earth surface would have long ago boiled our planet. Instead water vapour causes 3 negative forcings. 1) The very fact of evaporation of oceans and other water takes heat from the water and transfers it to latent heat. Also a little bit of heat is also taken from the air at the same time and is also turned into latent heat. That water vapour molecule then gets carried upwards by convection and the air eventually saturates and then condenses. The latent heat that is released then travels upwards into the high atmosphere and eventually lost to space. If that wasnt true then the 86.4 W/m^2 of evaporation latent heat would have unbalanced the earth energy budget 4 billion years ago when the oceans formed. 2) WATER VAPOUR IS ONLY PRESENT IN APPRECIABLE QUANTITIES IN THE LOWER 5 KM OF THE TROPOSPHERE. Increased water vapour in the lower troposphere( 5km or lower)reduces the lapse rate in the troposphere thereby dropping temperatures in the lower troposphere. The opposite happens when water vapour decreases. In that case the lapse rate increases and the temperature increases during the day. We are not talking about cloudy nights in a desert. That is a different phenomenon. You can easily see the lapse rate conclusions expressed by the fact that dry deserts mean average temperatures are always higher than wet moist jungles at the same latitude. 3) Cloud cover increases with increased water vapour and thus prevents some of the solar radiation during the day from getting to the ground thus cooling the surface. The UAH satellites have shown warming since 1979 but they have also shown that along with the lapse rate ( the higher regions are colder) the actual RATE of warming over the 38 year period is less the higher you go in the troposphere. Anybody worrying about ice sheets melting and causing a big decrease in albedo and thus more warming can rest easy because clouds are the cause of 97% of albedo on the earth with 3% caused by ice sheets. 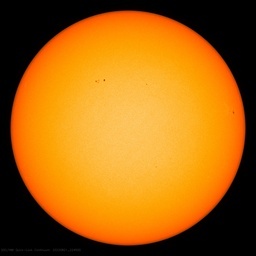 There is even a theory that all of the warming that UAH has shown is a result of the 38 year period having less clouds, thus increasing the solar incidence by 0.143W/m^2. So if water vapour is a negative feedback then we could add all the CO2 we wanted to; to the atmosphere and would only choke when it got to 10000 ppm. Of course the plants are only asking for 1000 ppm so we won’t go overboard. However at the measly growth rate of 1/2% per year in atmospheric CO2 , It will take us 180 years to 1000 ppm anyway. P.S. There could never be runaway warming in a desert anyway, because where are you going to get the extra water from ? It’s a desert!!!!!!!!!! The IPCC has been unable to counter the argument that only 8% of the upward IR has even the potential to be absorbed by CO2 and water vapour. Please put some meat on this. As you are aware, CO2 has very limited absorption characteristics. 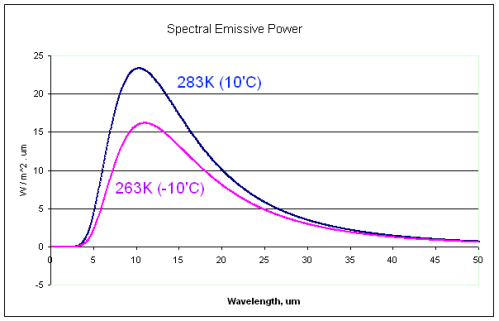 Carbon dioxide absorbs infrared radiation (IR) in three narrow bands of wavelengths, which are 2.7, 4.3 and 15 micrometers (µM). As you note, there is an overlap with water vapour. With reference to the 3 wavelengths, which the CO2 molecule absorbs, where within the planetary atmosphere is the IR (of the appropriate wavelength) to be found, and from where is IR of the requisite IR emitted? Does the surface of this planet emit any IR of the wavelength which the CO2 molecule absorbs (and then subsequently re-emit)? In other word, what part of the surface of this planet emits IR in the 2.7, 4.3 and 15 micrometers wavelength/wavebands? They measured the re-radiation from CO2 as it bounced back to earth from the moon. So the direction was sun-earth-moon -earth. Follow the green line in fig. 6, bottom. Note that it already starts at 1.2 um, then one peak at 1.4 um, then various peaks at 1.6 um and 3 big peaks at 2 um. It all comes back in fig. 6 top. experiment done to determine this? CO2 even has absorption in the UV which is currently how we identify its presence on other planets…..
seems my ref. page does not work anymore. I think you must look at fig 7 to see how it all comes together. The above study was only conducted for the oceans NOT LAND. For all subsets listed in Table 1, 99.5% of the variance can be explained by the first three PCs. So they have nailed down that the difference in surface temperature and the top of thick clouds is what causes the trapping of most of the outgoing IR that is trapped. 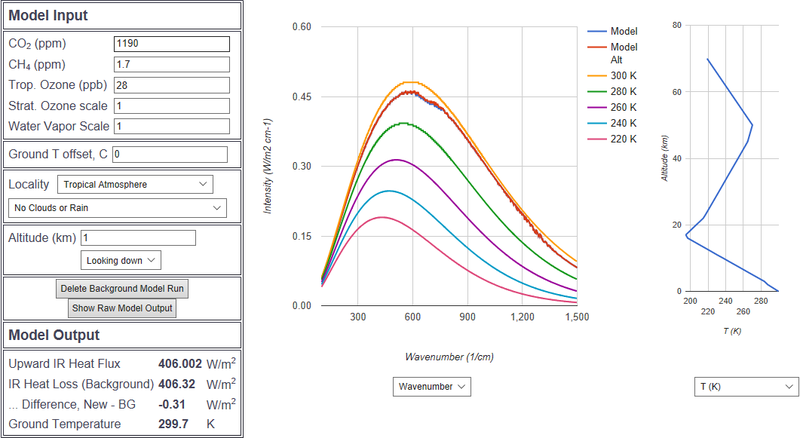 If you look at Figure 3a, you will see that from wavenumber 700 to 1600 which corresponds to 14.285 micrometers to 6.25 micrometers there is indeed upward LWIR in the band spectrum at which H2O and CO2 absorb. You have to reverse the diagram in the study in your mind to convert the wavenumber to wavelength. 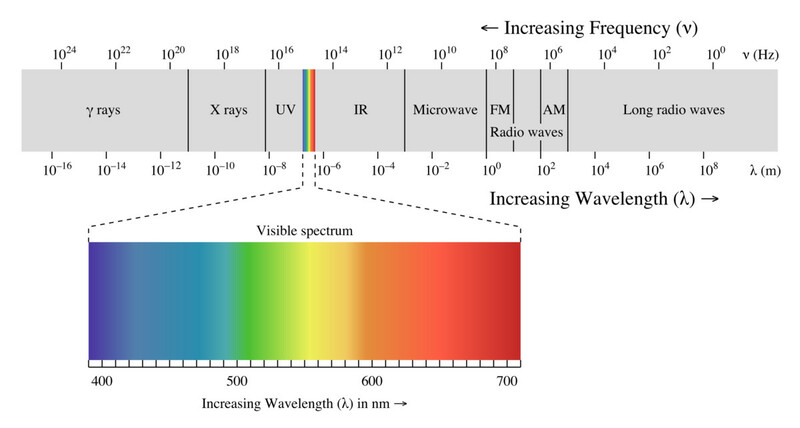 So there can be no question that the oceans DO emit LWIR in the critical wavelengths but the key question remains how much of that LWIR that is absorbed goes back as downward back radiation. We know that 50% has to go up despite what the NASA energy budget diagram gives, but how much goes back down? I believe very little ; because of collisions that happen 10^9 per second with N2 and O2. All very interesting but the devil is in the detail, and you appear to be reading too much into the images that you set out. The oceans do give off a BB spectrum equivalent to their temperature. The oceans cannot be emitting upwelling LWIR in the critical wavelength since the oceans are between say about -2 deg C and 36 deg C, and photons emitted from a BB surface at those temperatures are not of a wavelength that is absorbed by CO2. There are no oceans that have a surface temperature of – 80 degC which would emit 15 µm photons, and obviously no oceans with a temperature of more than boiling point. Sorry, but no. The Earth emits LWIR that is absorbed by CO2 and H2O. And it manages to get through a window at ~ 12 micron. This is how meteorological satellite observation “sees” the Earth in the infra-red, sees the surface and see things like fog. I assure I did as a professional meteorologist and how met services do now. Of course terrestrial temps emit most strongly in the IR, and are a wavelength that are absorbed by CO2. There is a correspondence between wavelength and temperature given by Wien’s Law. 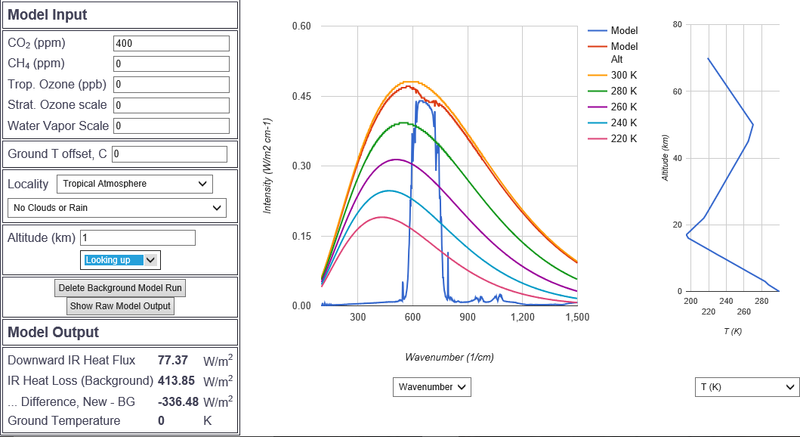 Whilst photons do not have a temperature per se, their wavelength corresponds to a BB temperature. There are only a few places where the surface of the Earth can be emitting photons of the wavelength that will be absorbed by CO2, eg., some places in Antarctica, the heights of Everest etc. which may be radiating at around the 15 µm wavelength from a cold surface of around – 80 degC, or perhaps over active volcanoes where temperatures may be in the 400 to 800 degC range. But these are very small areas. The upshot of this is that CO2 is unlikely to play any significant role in absorbing upwelling photons which are emitted from the surface of the planet and then reradiating them in the lower atmosphere, eg., say below the tropopause. CO2 maybe a big player above the tropopause, where upwelling photons emitted from the top of clouds might have the appropriate wavelength to be absorbed by CO2 in the mid atmosphere say above 17 km, or higher up in the atmosphere where it is either very cold or very hot, and where CO2 assists in transferring the energy to TOA from where it is radiated to the void of space. One sees a lot of images with Earth’s emission spectrum, but these are not a cross section by height, but rather an image taken from above TOA looking downwards. What would be interesting is if those images were taken say at 1 km, 2 km, 3 km etc above the surface looking downwards towards the surface, so that we could see what is happening where. This would greatly assist our understanding. At 30 C the maximum radiation wavelength is about 10 um. The resulting black body spectrum will have significant energy at 15 um. link You can use Planck’s law to calculate how much if you’re sufficiently ambitious. Water vapour on the other hand must be a significant factor for downward back radiation because you need the atmosphere temperature to be warmer than the oceans to have evaporation. Without evaporation there is no way to get rid of most of the solar heat that is absorbed by the oceans. We know that NASA got some of their energy budget numbers correct including initial incoming solar and the evapotranspiration number. That evapotranspiration number of 86.4 W/m^ represents more than 50 % of the total absorbed energy by the surface. Without evapotranspiration the oceans would boil over. So the atmosphere needs to be warm enough for that to happen. Even so the oceans are on average 1 or 2 degrees warmer than the atmosphere. Some of the heat lost by oceans is by conduction because of that difference in temperature. However when the temperature difference reverses, you get evaporation. What I can’t figure out is why NASA gives Conduction only as 18.4W/m^2 from the surface to atmosphere plus another 40W/m^2 straight up through the atmospheric window. So that total is 58.4 which is still less than the 86.4 from evapotranspiration. If the surface is on average warmer than the atmosphere how can evapotranspiration be more than the sum of conduction and the 40W/m^2 direct through the atmospheric window? Can you have some evaporation from the oceans when the atmosphere is colder than the ocean surface water? Without evaporation, the tropical ocean heat engine of Earth is warms the rest of the world, less. Or tropical ocean heating rest of the world, would limited to ocean surface waters moving poleward- though granted such movement of surface waters is large heat transport mechanism. And as general matter, without evaporation of the ocean, land aren’t warmed much by the ocean. One should keep in mind the tropical ocean is the heat engine of Earth, and not the tropical land area. Though land areas can have higher daytime air temperatures, Land areas are global cooling effect. It obvious that Antarctic continent has global cooling effect, but I venture to say the Sahara desert is a cooling effect and if Sahara desert were instead a grassland [water is added], it would have less of global cooling effect [would increase global temperature by a small amount]. Add more water and make it a huge swamp- then it’s more of warming effect. All you need for evaporation to take place is for the atmosphere to be at less than 100% relative humidity. The only difference temperature makes is in how much water the atmosphere can hold. Fog over lakes in the fall is an excellent example of this. Okay assuming that oceans dont emit at the wavelengths that CO2 needs, do you agree that the oceans emit at the wavelenths that H2O likes? And for land we know that on a dark cloudy night in the desert it is a lot warmer with the clouds than without them. So even in the non desert areas it must be warmer with the clouds at night than without them. So all of this backs up the claim that H2O causes backradiation but does CO2 cause it over land? With MODTRAN you can do that. When you tabulate the radiances (looking down=upward radiance above) for different CO2 concentrations, you find that they are step functions. Above at one kilometer you find that there is no change in upward radiance from 140ppm to 1190ppm, and the increment is only .31 W/m2. 140 and 1190ppm are the red and blue curves with small deviations from the Planck curve at the CO2 fundamental bend etc. You can also look both up and down from the same altitude. Above is CO2 only up and down from a kilometer. Blue is looking up, red is down. Similarly to the “all in” first graphic, the radiative temperature is ~295K in the fundamental bend deviation, both up and down. The deviation is more extreme CO2 only because CO2 and water interfere with each other. According to MODTRAN the first deviation from the Planck curve for 400ppm CO2 is at about 400 meters. MODTRAN is pretty good. It was developed with a military rather than a political agenda. Alan, a minor point – the IPCC wasn’t chartered to do any science, therefore isn’t responsible for providing the mechanisms. The job of the AR authors is merely to assess the science, as found in those peer-reviewed papers they choose to accept, and then draw conclusions. If the mechanism aren’t described in the selected papers, well, tant pis. Their “job” is that if a kangaroo court, to find “human induced” climate change guilty of said ruination of the planet. This was never about looking for actual drivers of climate. If the above is part of their charter, then it is impossible to assess the scientific informtion without having a scientific understanding of how the process works. You cannot proceed to assess the human impact until you have assessed how much natural variability there is. The IPCC has never been able to come up with a number. The reason is that they have no scientific basis for calculating that number. We have been living in an Ice Age for more than 1 million years. The cold ocean has remained between 1 to 5 C for more than 1 million years and our ocean is currently about 3.5 C. And during the last interglacial period our ocean warmed to about 5 C.
If ocean warms to 5 C, you will get a higher amount of global water vapor- or you get this “positive feedback”. But not driven or forced by atmosphere- if ocean is warmed [by any means] you will get it, or can not have ocean with average temperature of 5 C and not get this increase on global water vapor. In distant past, Earth oceans have been much warmer than 5 C, and when ocean have higher temperature than 10 C, you are entering a Hothouse climate. So currently our ocean average temperature is 3.5 C and our global ocean surface temperature is about 17 C. And the average of all land surface air temperature is about 10 C. And average of ocean surface temperature of 17 C and 10 C gives the average global temperature of about 15 C. 70% ocean and 30% land. What causes water vapor is having a warm ocean surface. And what causes global water vapor is mostly the tropical ocean, which as average surface temperature of about 26 C. Or as we know, the tropical ocean is the heat engine of planet Earth. The tropical region is about 40% of the entire Earth surface. The warm tropics could be said to providing an illusion that we living on a warm planet. 15 C is not warm- one could say it’s passing grade for the class, but with tropical portion of 40% class being about 26 C, it raises the class average score to a passing grade of 15 C. So one has 40% of class getting a A score and rest of class flunking. But since tropical ocean is warming the rest of world, it’s also improving the learning ability of the rest of the rest- they would be troll students without the tropical ocean helping them. The ocean outside of tropics is also warmer than land average temperatures and keeping these land area warmer. And if average ocean temperature was say 5 C rather than the current temperature of 3.5 C, the ocean surface temperature outside of tropics is warmer [or can be warmer]. Or with 5 C ocean the ocean surface of 60% of oceans can be warmer and could raise average surface temperature of entire ocean from 17 C to a higher global average surface temperature of 18 C or warmer which causes higher global water vapor. And that has huge effect upon land average temperature- the 60% of ocean is warming the land’s average temperature much more than it is now. Or over last few centuries the ocean surface temperature has increase by about .5 C and land average has warmed by more than 1 C.
If you had ocean average surface warm by 1 C, it has large effect. But without entire ocean warming, it limiting how warm the surface ocean can be outside of the tropics. Or maybe ONAT are the only things actually causing anything. Sooo….other natural forcings overpower CO2! CO2 must be weaker than was thought. Of course, we must consider that China has a vested interest in refuting the worship of the C02 devil in order to further its energy and land expansion efforts, and not inhibit its own growth… So it might appear that the carbon offset monies lost are overshadowed by the potential income from expansion. Nonetheless, if their science is genuine…. that is correct. They are big believers if you have the bucks to buy from them. Even the people promoting this crap don’t believe it…..
You have to be careful, here. Global warming (broadly) is not a hoax. The hoax comes from the (now almost invariably, implied) insertion of the word, “anthropogenic”. This whole unsavoury business of, “Surely you believe in Climate Change.” is derived from the seamless (and dishonest) practice of implied anthropogenic responsibility. While this scientific chicanery is by no means unique to Climate Science, it well illustrates how far modern Science has departed from its vaunted high standards. China must sit in a cloud of particulates/aerosols and goodness knows what other pollution, which most likely has a bigger contribution to temperature than CO2. But which way and how they all interact, and then with natural factors too……..if any climate scientist can honestly sort all that out? SHANGHAI (Reuters) – Air pollution caused by coal-fired winter heating has slashed life expectancy in northern China by more than three years compared with the south, according to a new study, underlining the urgency of Beijing’s efforts to tackle smog. I have a suspicion that as the PRC is not tied into global warming dogma, their weather reporting system might actually be accurate. I find it hilarious that this anti-deleuvian thugocracy is “leading the scientific world” in accurate temperature measurement. I guess they didn’t get the Mann message to “hide the decline”. Given that predominantly the right-wing in the U.S. and an enormous communist country maintain the same view on climate forcing and a warming hiatus I believe it is reasonable to conclude that the science is not a political issue. Therefore the left-wing segment of the U.S. that argues for climate alarmism does so for a purely political agenda, and without scientific merit. Apparently the Chinese government does not reward scientists with grants authorizing studies that reinforce The Agenda. The Chinese government realizes that they can’t have their scientists as part of groupthink because that would mean that their scientists would become stupider and would bias all of their science in the wrong direction the way that western scientists have. No sense paying scientists to produce false reports. At the same time the Chinese government has a vested interest in making the West think that they believe in global warming so that the west will continue to bankrupt themselves by trying to set an example. I hear that all the time TRYING TO SET AN EXAMPLE. I am so sick of that phrase. I first heard of it 15 years ago from some scientists. So we have been trying to set an example for 15 years , but the Chinese arent buying it. What is incredible is that Obama bought the idea that the Chinese were buying it. The Paris agreement was the stupidest agreement in history where one side promised only to try to slow down emissions in 15 years time and the other side said we will guarantee that we will. Obama … trying to hustle the East … what a laff. off topic but http://www.cbc.ca/news/canada/north/kugaaruk-passenger-ship-refloated-arctic-1.4799050 An update re the Akademik Ioffe cruise. I have talked to Chinese colleagues about this and the reasons are complex. While Chinese scientists are not in the dining car of the CAGW gravy train, it is very difficult to advance in China if your publications don’t reinforce your supervisor’s views. And how is that different from the USA.? I’m Canadian. My supervisor never asked me to alter any of the wording in any of my publications let alone findings. A terrible sample I know. Maybe I was the exception. Others might have other experiences?? In other words, the dog ate China’s “global warming”. …did they just say GHG’s made it cooler? Interesting that they start the pause in 2001, well after the effects of the big 1998 El nino, so alarmists can’t say they cherry picked the start point. If they didn’t correct for the Urban Heat Island effect, which is presumably large in a rapidly industrialising country then the pause would turn into a negative trend. Some of the warming that was recorded is lkely due to infrastructure growth. 4. Make someone suffer, preferably the poor. Yeah, OK, BUT… I mean, we had a “pause” only in Asia, North America, and Europe. And South America. And Australia. And Antarctica. But what about Africa? I mean, otherwise how can we claim this was global climate, and not just local weather? So have you constructed a true combined “Global” temp map for the past 100 yrs to date ? Also the main issue i personally have is that graphical presentation of data is intended to make understanding the data much easier. Your “Global temp Contour” maps do not do that. They are much more conplex and difficult to understand than the simple line graph , but are still trying to highlight the same basic points. there is a well known saying, “Everything Should Be Made as Simple as Possible, But Not Simpler”. I have made global warming contour maps as Simple as Possible. Any simpler, and they start losing information. A line graph does NOT do this. You may look at a line graph, and say, “there is a definite slowdown/pause”. But Tamino looks at the same line graph, and says, “You are an idiot. There is NO slowdown/pause”. The warming rates on a line graph, are SUBJECTIVE. So you produce a linear regression from 2000 to 2012, and say, “Look Tamino, scientific proof of the slowdown/pause”. And Tamino looks at you, and smiles, and says, “You cherry-picked that date range. That doesn’t prove that there was a slowdown/pause”. With a global warming contour map, there is NO cherry-picking. It shows you EVERY possible warming rate (between 150,000 and 350,000 of them). NOBODY can accuse you of cherry-picking. That is why I developed global warming contour maps. Global warming contour maps, can be interpreted on a number of levels. Some simple, some complex. Colour is a simple level. The colour is red on contour map 1, and orange on contour map 2. Therefore the warming rate was greater on contour map 1. Even a 5 year old can understand that. Perhaps you need to put a little more effort into learning how to understand global warming contour maps. It is well worth the effort. The main problem is NOT that global warming contour maps are too complex, it is that people are too simple. Learn about global warming contour maps, by studying Robot-Train contour maps. so what are your graphs, telling exactly,? is it globally cooling or is it globally warming? you might want to click on my name to read my final report on this. By way of overview to Alan Tomalty and others on positive and negative feedbacks, it is worthwhile recalling the views of James Lovelock. You know that the implicit admission here is that there is a clear warming both before and after the ‘hiatus’? Leave it to the communists to screw up the narrative for our socialists.